I recently had the pleasure of working with Chris Duhaime of Pivot (www.thepivotplan.com) on a project for a local manufacturer representative firm, Paul Varg Sales LLC. Designed By Day's involvement included taking the Pivot web design and creating a new, cross-browser friendly tableless HTML document, and then integrating the Designed By Day CMS (really need to find a name for that thing... and DBDCMS just sounds silly). There were a couple of custom elements with this project, including the need for a dynamic "Tech Tip" area on the homepage. The client wanted to be able to have a rotating tech tip, so each time the home page loaded, a different tip would appear. With some custom web development, the CMS was customized to allow him this feature, as well as the ability to add new tips and edit existing ones whenever he likes. 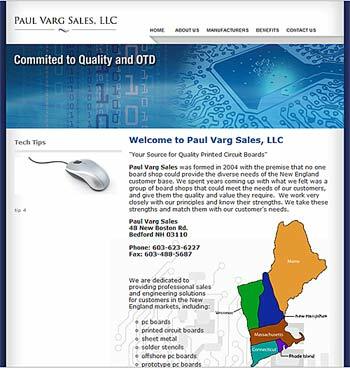 Paul Varg Sales is a full service manufacturers' representative firm providing engineering and sales representation to customers in the New England market since 2004. Learn more at www.paulvargsales.com.